This Anti-smoking advertisement is very effective and creative. It definitely gets its point across and if very informative. When looking at this ad, the picture is worth 1000 words. There is a limited amount of actual words written on the ad but that’s all that is needed. The ad shows a lot of truth toward the product. It’s saying that if you kill the habit of smoking you can save your life. The ad is authentic and definitely catches the viewers attention, it is trying to get smokers to realize they are harming their body with each puff. The ad is respectful, it is blunt and honest, but it does also respect the audience enough and still get its point out. The equity of the ad is very understandable. When viewing this ad you are able to understand what the advertiser is trying to promote. 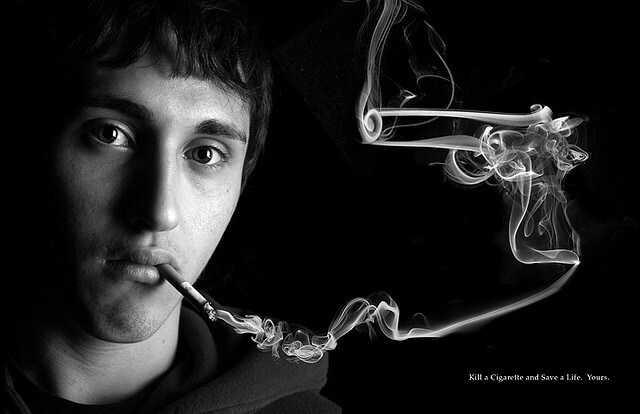 I believe that this nonsmoking ad definitely passes the TARES test and was a creative way to promote nonsmoking. It’s very easy to understand and the message is clear. I agree with you that this ad passes the TARES test. It is straight to the point and gets the message across without being disrespectful or insensitive. Like you say, the picture is worth 1,000 words since it definitely tells us that smoking is bad. Without the need of too many words, the ad is able to catch our attention and make us think about bad habits and how a decision can change our life. It is truthful, authentic, and does not disrespect anyone. In terms of social responsibility, I also think the ad does a good job. It is creating awareness towards the negative consequences of smoking and as a result, it contributes to society in a positive way. It is a great ad with a very important message. I totally agree that the picture is worth 1000 words because the majority of this ad is a picture! You don’t even need words! I love your choice of an ad. It was very moving.